Website owners and people involved in the web often ask why SSL certificate is necessary for them. The best way to provide an answer to this question is seen when making a purchase online while caution needs to be exercised. It is easy to insert your credit card into an automated transfer machine, but one becomes very thoughtful in transacting business over the internet with that same credit card. The idea is that, at least if you notice anything funny after your purchase with the ATM, you could easily walk into the bank and make a complaint. However, someone in China who wants to buy from a website in the US would want to be very sure that their credit card details would not be made public. A consumer would need every possible argument to ensure that his security when performing a transaction is guaranteed hence he has to be cautious when deciding on the SSL certificate provider. What is SSL? SSL is an acronym for secure socket layer. It is a standard security technology that is used to establish encrypted link between a web browser and a web server. SSL certificate is a necessity for a website that collects information such as credit card and other personal data of customers on their site. The organisation that manage the SSL certification, issues the SSL certification to website owners through their host. Organisation like Symantec SSL, GeoTrust SSL, Thawte SSL, RapidSSL are renowned brands in the market to source for SSL certificate. When a website is issued a security certificate, it gives the site a sense of legitimacy. 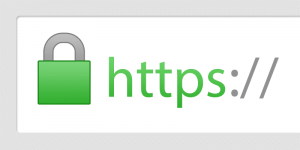 What then are the benefits of having an SSL certificate? 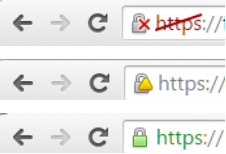 The three different scenarios in the picture show three security level of a given website. Google.com has recommended that website owners have an SSL certificate. The following are the major benefits of having an SSL certificate. With the presence of SSL certificate on your website, every information that is relayed to your website will only be available for authorized parties – by authorized parties, I mean those who are supposed to see this information. The SSL certificate converts this information to codes that cannot be easily understood by any other third parties in the case where the system is hacked. Google as one of the primary internet decision makers – have information’s about consumer behavior and have noticed that most customers would not want to shop on sites that do not have a secured encrypted layer in place. To help you choose the suitable SSL certificate visit HTTPS.IN and avail of our technical support offered by us.